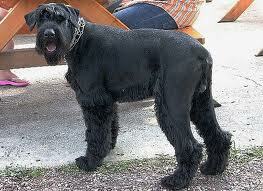 It's a Giant Schnauzer. I think it's weird because I see lots of normal-size schnauzers and I am used to that. I'm not used to the giant ones. It totally freaks me out. It's like when the car next to you slowly starts to roll forward and you feel discombobulated like you are going backwards for a second. 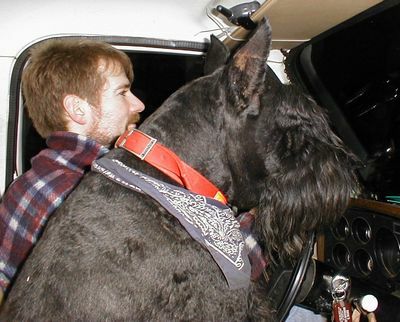 When I see these huge schnauzers my sense of proportion falters. Did I just get really small? Was that dog created in photo shop? You expect a Great Dane to be really big. But not a Schnauzer. That's why it's the weirdest dog to me. We had a mini schnauzer, and the wonderful woman who groomed her for us had a giant schnauzer who was the most wonderful dog. Granted, the scale can seem a bit off, but I thought he was beautiful! I think all dogs should wear monocles. Make it so. Also, my word verification is thuntar. Wow! Unless that lady is really tiny, that dog is as big as our Great Dane. That is weird! All large dogs give me pause! Can you imagine the size of poop that comes out of a dog that size?! Dogs shouldn't be that size. It's not right. That is exactly what goes through my mind when forced to watch Clifford The Big Red Disgusting Dog. Hit the brakes, hit the brakes! 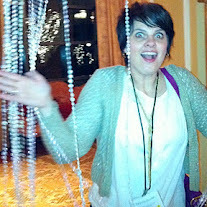 Oh wait. . .freakishly big. Specialized breeding should only make things smaller and cuter. This is just bad science. I can't wait for your post on Shasta the liger at the Bean Museum. Are you "pro" or "anti" Shasta? That is one crazy looking dog!